Why You Ride: Bicycle Edition – Vanessa Gray, C.I.C.L.E's new executive director! We are collecting nominations for the Year-Round Golden Pedal Awards, Metro’s competition for great stories about bicycling. We’re featuring these stories in a monthly Why you Ride series because for many Angelenos, Bike Week never ends! Origin and destination: From Silver Lake to destinations around Hollywood and Downtown L.A. Distance: Short and medium commute – Vanessa rides anywhere from 3 to 10 miles each way. Type of commute: A combination of multi-modal and clever commute. The commuter: Seasoned (she’s been doing this a while); chic (riding with flair); and zealous (encouraging others to try pedaling to school or work). 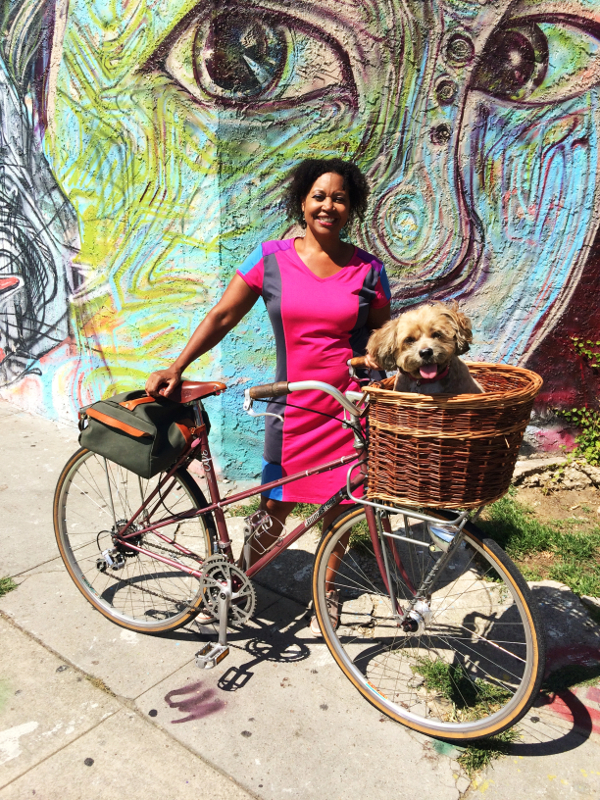 Vanessa Gray, new Executive Director of C.I.C.L.E accompanied by her cute dog and awesome vintage bike. The Bike Week LA team is thrilled to give Vanessa Gray the July Golden Pedal Award. Vanessa is known for living and breathing the bicycle lifestyle. She’s out riding in style on her vintage Bridgestone bicycle practically every day. She is a true role model and example when it comes to showing everyone that one can use a bicycle to get around town and look good while doing it! Vanessa recently became C.I.C.L.E.’s new executive director. We’re sure she will work hard to further the organization’s mission to promote bicycling as a viable and everyday form of transportation. Vanessa understands that community-based engagement and education is a great way to build a large bike community and help lead to a higher quality of life for everyone. She has volunteered at C.I.C.L.E. events and with LACBC. Vanessa also coordinated the Safe Routes to Schools’ Walk to School Day at Micheltorena Elementary School. As a member of Silver Lake’s Neighborhood Council Transportation Committee, she works to make Silver Lake safer for pedestrians and bicyclists by building community support to install a much needed traffic light at the corner of Edgecliffe and Sunset. In addition to volunteering for bike advocacy events, Vanessa also bakes jalapeno and cheddar bagels for hungry cyclists stopping by her Bike to Work Day pit stop and makes glazed and chocolate doughnuts to celebrate a bicycle shop’s anniversary. She has a Bachelors degree in English with a minor in Chemistry from Old Dominion University and a certificate in Baking and Patisserie from LeCordon Bleu College of Culinary Arts in Pasadena. With help from our generous Bike Week LA sponsors, Vanessa will receive a Bike Week LA T-shirt, a bag with a Nathan safety vest, bike patch kits, ankle straps, bike maps, Metro Bike Guides, and “Every Lane is a Bike Lane” bumper stickers. Click here for more information about Vanessa and her new role as C.I.C.L.E.’s director. It seems like all bike/ped/green/transit advocates live in Silver Lake. Either that, or all reporters live in Silver Lake. Time to go beyond the comfort zone ? It seems like you should read The Source more. I just did a quick search (top right corner of the page, I encourage you to fact check) of recent Golden Pedal Award winners. Of the past 14 winners, only two live in Silverlake, and those are the only two who commute through Silverlake. Time to go beyond the comfort zone and start objectively observing LA?